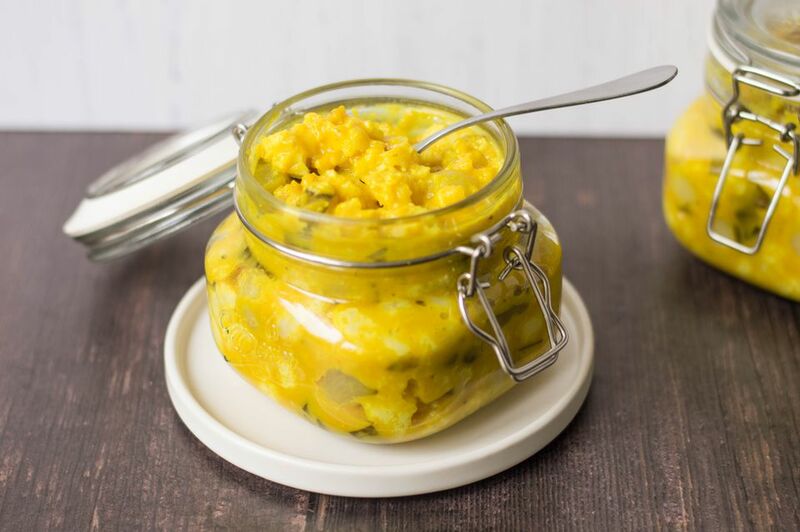 Despite Piccalilli being one of Britain's favorite pickles, it is surprising that its origins, or the original Piccalilli recipe, remain something of a mystery. There's no doubt it is connected to the Indian sub-continent; some sources say Piccalilli was also known as Indian Pickle, and the Indian pickle Achar is similar also made with mustard, vinegar, and salt and shares the same yellow color. Whatever its origins it's a British food favorite and no cooked ham, cold beef, Ploughman's lunch or buffet table is complete without a bight yellow dollop. It is easy to make and will keep for several months in sealed jars. Note: while there are multiple steps to this recipe, this Piccalilli dish is broken down into workable categories to help you better plan for preparation and pickling. In a bowl large enough to hold the water and all the vegetables, dissolve the salt in the water. Add all the vegetables and capers. Put a plate on the vegetables to make sure they stayed submerged in the brine. Cover and keep in the fridge for 24 hours. Place the two vinegars, pickling spice, and sugar into a large stainless steel pan and bring to the boil. Reduce the heat and cook for 15 minutes. Leave to cool overnight in the fridge. The next day, remove the brine and vegetables from the fridge; drain and rinse the vegetables well. Place the rinsed vegetables into a pan, cover with cold water, then bring to the boil. Reduce the heat to a gentle simmer and cook for 10 minutes. Drain and leave to one side. In another pan, melt the butter, then add the flour and stir thoroughly. Cook gently for 5 minutes taking care not to burn the flour. Strain the spiced vinegar and slowly add to the butter and flour, cook for 2 to 3 minutes or until thickened. Add the turmeric, mustard powder, and black pepper and stir well. You should now have a brightly colored, thick sauce. Pour the thick sauce over the drained vegetables and stir well making sure all the vegetables are coated in the sauce. Keep for at least one week before opening (preferably longer but the temptation to try it may be too strong). Once opened the jars must be kept in the refrigerator, unopened the jars will keep for at least six months in a dark, cool place.